Between September and January, the total average closing time (including delays) increased for six types of mortgage financing. The average closing time for purchase mortgages with a down payment of at least 20 percent backed by Fannie Mae or Freddie Mac increased 5 days from September to January. Most home purchases continue to close on time, but the scheduled closing time has increased. The total U.S. loan delinquency rate (30 or more days past due but not in foreclosure) was 5.09 percent, up 6.62 percent month-over-month but down 7.10 percent year-over-year. The total U.S. foreclosure pre-sale inventory rate was 1.30 percent, down 4.53 percent month-over-month and 25.69 percent year-over-year. Total foreclosure starts totaled 71,900, down 7.94 percent month-over-month and 22.94 percent year-over-year. The delinquency rate for mortgage loans on one-to-four-unit residential properties dropped to a seasonally adjusted rate of 4.77 percent of all loans. This is the lowest level since the third quarter of 2006. 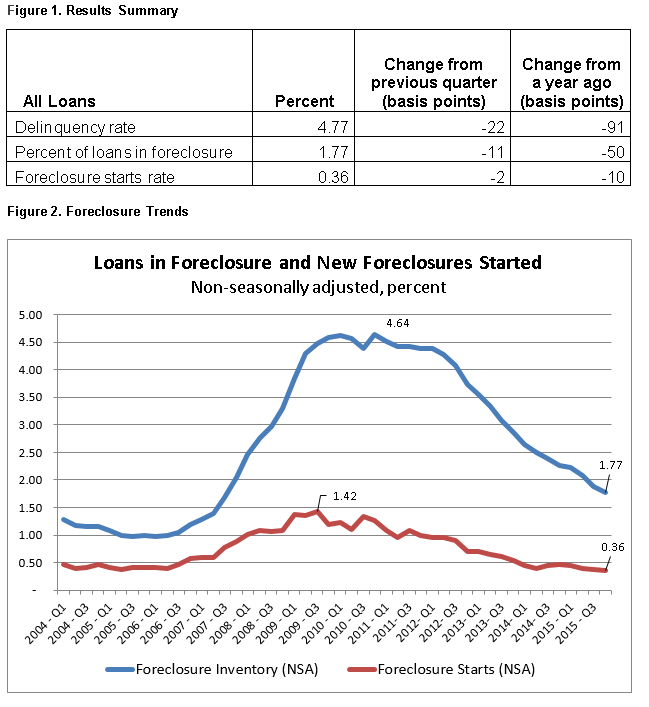 Loans on which foreclosure actions were started comprised 0.36 percent of all loans, down two basis points quarter-over-quarter. 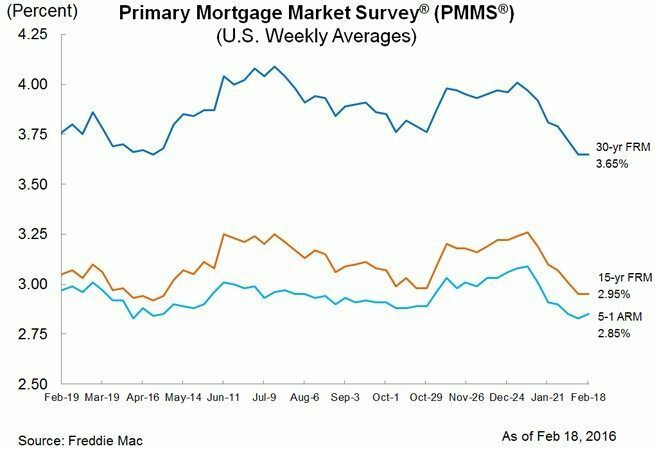 The 30-year fixed-rate mortgage (FRM) averaged 3.65 percent with an average 0.5 point for the week ending Feb. 18, 2016. One year ago, the 30-year FRM averaged 3.76 percent.